Today I’m sharing a Festive Fall Recipe that for sure will be a hit during your Thanksgiving Dinner or any other party! 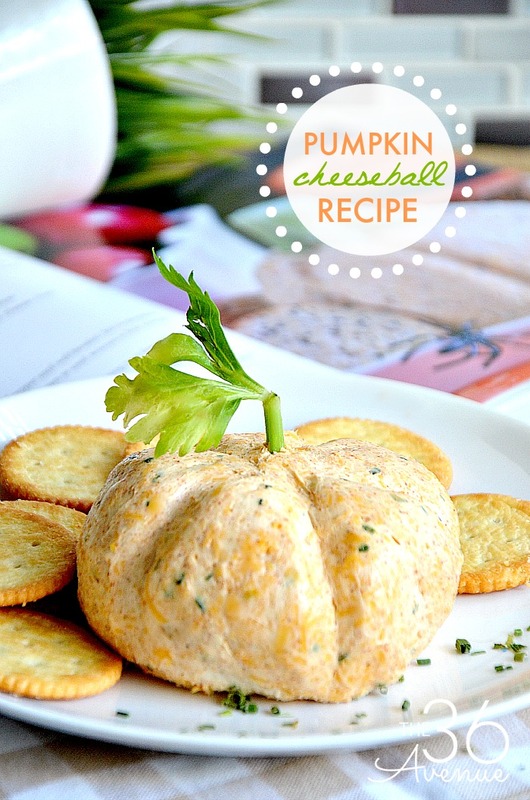 This Pumpkin Cheeseball Recipe is super easy to make and so tasty, besides how cute is the pumpkin shape? This is one of the many delicious recipes that my friend Jeni Potter from Bakerette is sharing in her new book, Festive Feast! You are going to love it! This is for sure one of the best homemade cheese balls that I have ever tasted. It is creamy, full of flavor and simply yummy! I didn’t have broccoli at home so I used celery to make the pumpkin stem… So cute! Combine cream cheese, onion powder, chives, paprika, and red pepper until well blended. Stir in shredded cheddar cheese until well combined. Cover and refrigerate up to 2 hours or until mixture is firm enough to shape. Shape mixture into a ball. Smooth the entire surface with a spoon or spatula. Using your fingertips, create vertical grooves in the ball to resemble a pumpkin. Remove florets from broccoli stalk and reserve for another use. 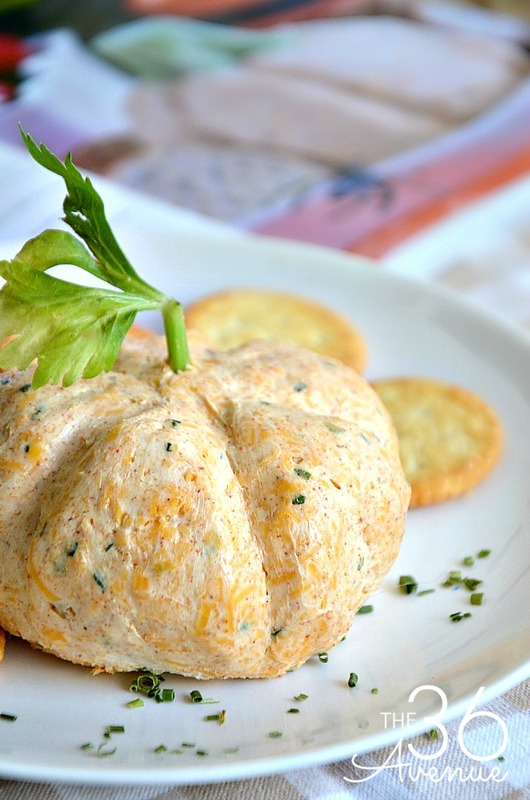 Cut stalk to resemble a pumpkin stem and press in the top of the cheeseball. Serve with crackers, apples, or celery. To make ahead, wrap cheeseball in plastic without stalk and store in the refrigerator up to 2 days. Just before serving, create grooves and attach stalk. This Festive Feast Book will make the perfect gift during this Holiday Season! The recipes are easy to make and you have everything to make the perfect meals and memories from Halloween to Christmas. With over 75 mouthwatering recipes you’ll be a happy cook. 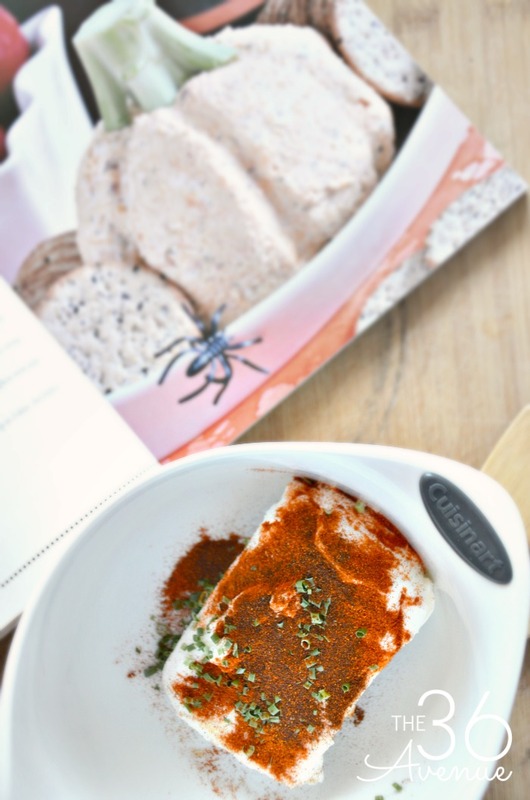 Among my favorite recipes here there is Jeni’s Butternut Soup, Cranberry Glazed Turkey, Red Velvet Oreo Fudge Brownies and Santa’s Whiskers to give away to family and friends! 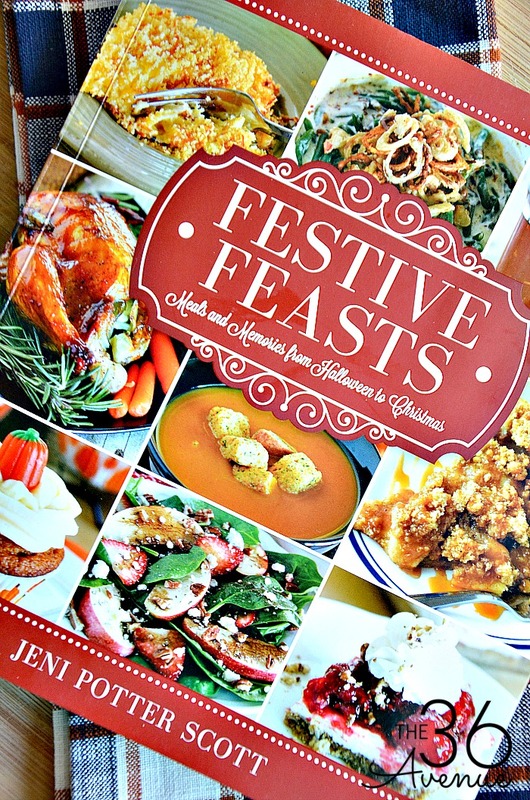 You can buy Jeni’s delicious book Festive Feasts HERE. For more yummy recipes from Jeni make sure to visit her blog Bakerette and check out her book HERE! Thank you so much for visiting with us! Thank you so much Desiree for sharing my book and a recipe to boot! I’m glad you liked the cheeseball! The celery stem is creative and looks so cute! Thank you Jeni… I love your book! We make a cheeseball every year for holiday entertaining. This one is ADORABLE and I can’t wait to give it a try. It is so yummy and super easy to make… Enjoy! Is ground red pepper like paprika or cayenne? Yes, you can also use ground chipotle chili pepper and is delicious!